In March 2010 a 58 year old man presented to this clinic with pain in the left sacro-iliac joint (the left pelvis joint) and pain in the left calf muscle. He reported suffering with lower back pain intermittently for the last 15 years. The pain that he felt in the left sacro-iliac joint had been worse for the last two months, there was some pain in the left hip and some tingling in the left calf muscle as well. When I examined him standing his pelvis was tilted so that the right side was lower than the left. His lower back looked like it had reversed and was curved backwards rather than forwards. This man was able to perform all movements without any significant pain but found changing positions difficult. He reported finding it difficult to roll in bed, get out of bed and get up out of a chair. The examination took on a really interesting turn when I examined his back while he was lying on his stomach. For a person that was able to move in all directions without any pain his lower back was very sensitive to touch. So much so that light pressure resulted in a very sharp sensation of pain and his back was reactively spasming. Now when people have lower back pain they are often very sensitive to touch but his was very jumpy. Due to the unusual degree of sensitivity and the reversal of his lumbar curve I sent him off for xrays. 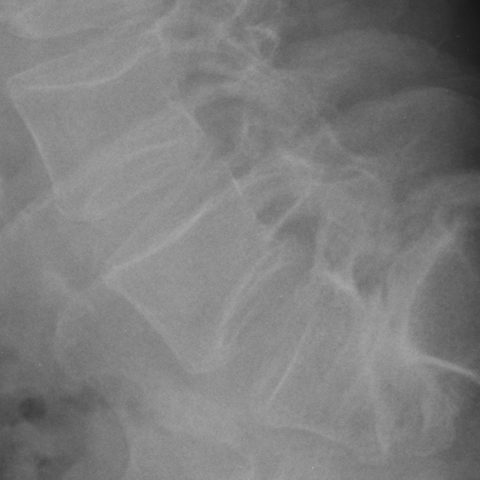 The xrays revealed a Grade IV Spondylolisthesis. What this means is that the very bottom vertebra just above the tailbone had slipped forward to the point where over 80% of the vertebra was in front of the tailbone below. This is quite rare and in most people the vertebrae sit precisely on top of each other. To say that his spine was precariously perched was an understatement. In the image above there are three vertebra that run diagonally down the screen from left to right. One third up the right side of the image is the tailbone. This is the bone that should be directly below the other vertebra and should be in the bottom right corner of the image not one third of the way up the picture. Having made a definite diagnosis of this man’s condition it was time to progress to the treatment. There is a specific chiropractic adjustment for this condition however the question was would he be able to receive the treatment without aggravating the condition. There is a specific safety test to make sure that the adjustment is not going to worsen the condition and he passed it so we proceeded to gently adjust him. After two treatments the patient reported feeling better and after four visits he felt significantly better. This patient received a total of six treatments and is now symptom free. His last treatment was two months ago and the symptoms have not returned. Now to qualify the chiropractic adjustments did not “fix” his back as he will always have a grade IV spondylolisthesis however the treatment was sufficient to clear out the inflammation that was present and remove his symptoms. He should now get a chiropractic check up every three to six months to ensure that his symptoms do not return.